The Takasago plant of Kaneka Corporation has been saving energy in various ways. Recently, it adopted Yokogawa's advanced process control (APC) to achieve optimizing control of complex operation patterns in its boiler, steam turbine, and generator (BTG) facilities where most of the energy is consumed. 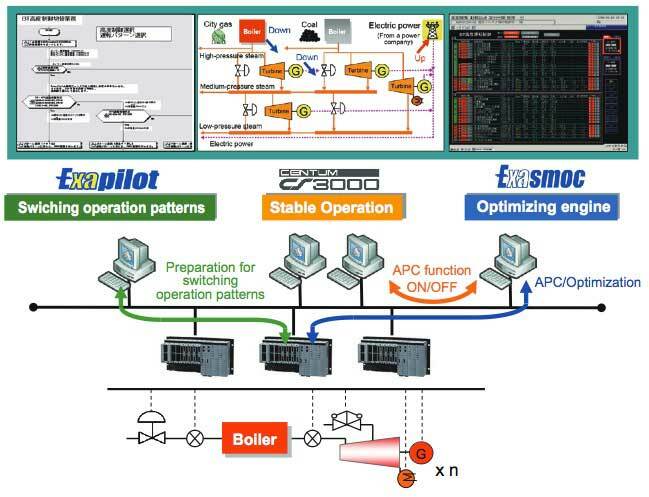 Optimizing control by APC combined with Yokogawa's Exapilot operation efficiency improvement package which automates manual operations helped not only to reduce fuel cost and CO2 emissions but also to save labor. For a coal fired power generation plant (hereafter referred to as "BTG facilities," in which "BTG" stands for boiler, steam turbine, and generator) supplying power to a large-scale production plant, the CO2 emissions from such facilities are a critical issue today. One of the reasons why coal is commonly used in such facilities is because of its lower fuel cost. In recent years, however, the import price of coal has risen due to the heavy appetite of emerging Asian countries such as China and India. Additionally, the Ministry of Economy, Trade and Industry has announced a policy to raise the tax on petroleum and coal to compensate the anticipated global warming tax (environmental tax), which is expected to be enacted in fiscal 2011. Under these circumstances, optimization of plant operation is a key issue for reducing both fuel cost and CO2 emissions from BTG facilities. BTG facilities supply utilities such as electricity and steam, and are controlled to meet the shifting demands of the production process over time. In BTG facilities, unlike from those of power companies, steam pipelines are complicated, the boiler dynamics depend on the fuel type, and there are various types of steam turbines, such as condensing, back-pressure, and extraction. Thus, BTG facilities place a heavy workload on operators to adjust the operation to meet the drifting demands between daytime and nighttime and the changes of the production process. This paper introduces an example of a solution demonstrated at Kaneka Corporation using Yokogawa's distributed control system (DCS), advanced process control (APC), and Exapilot operation efficiency improvement package, the procedural automation package. Background of introducing the BTG optimizing control service to the Takasago plant of Kaneka Corporation is described below. The Takasago plant of Kaneka Corporation launched a cost reduction program named ADVANCE17. This program was a part of the company's environment focus initiatives including energy saving and reduction of CO2 emissions. Most of the huge amount of energy used in the Takasago plant is for BTG including its fuel and purchased electricity. Energy conservation is becoming increasingly important because of the increasing crude price and so the plant is focusing its activities on this facility. The Takasago plant of Kaneka Corporation planned to optimize the BTG operation by applying Exapilot and APC to the existing DCS. A model adapting function is added to APC to simulate all the varying patterns of operation by the combination of boilers and turbines for more stable operation. There seemed to be no room for further energy savings in the Takasago plant where many improvement activities had already been implemented including hardware modifications and an application of Exapilot. However, the Takasago plant found further opportunities for saving energy by applying Yokogawa's APC which was proposed by Yokogawa and had already been applied in other plants. A desk plan showed some economic effect by automating manual operations using APC. However, it was anticipated that only a little effect would be realized because the load of the operation of BTG facilities had already been strictly controlled and the field operators had little knowledge about APC. In response to Yokogawa's proposal, however, the Takasago plant decided to introduce APC in cooperation with Yokogawa, which has great knowledge in this field and particularly in DCS, as it was aware that further cost reductions and improvements in environmental management were urgent matters. Since APC requires parameter changes every time the pattern of operation is changed, it was anticipated that it would increase the workload on operator. Therefore, manual operations usually conducted by operators, such as changing model parameters, PID loop configuration, and control parameters when changing operation patterns were automated by using Exapilot together with APC3. APC and Exapilot were designed to synchronize and complement each other's functions by sharing the memory of the DCS. Figure 1 shows the cooperative system configuration of APC and Exapilot. Figure 2 shows a configuration example of APC products provided by Yokogawa (in light blue color). 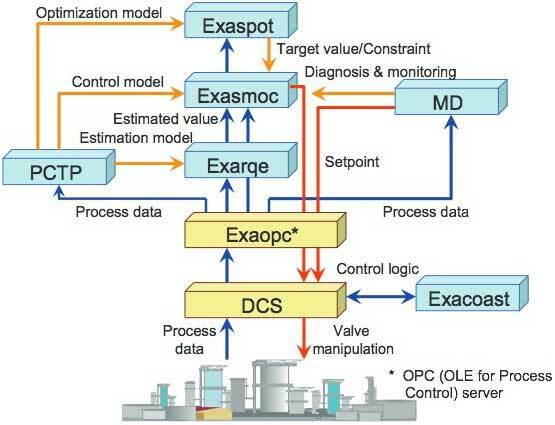 Among these products, the features and functions of the Exasmoc multivariable model predictive control package are described below. Exasmoc is a core product of APC12. 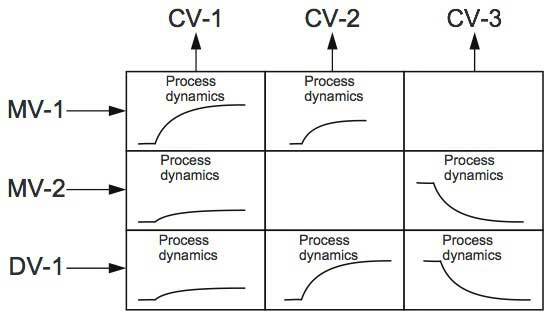 As shown in Figure 3, Exasmoc simulates the target process dynamics as a model with multiple inputs and multiple outputs, and controls the process by predicting its dynamic behavior several steps ahead. An Exasmoc controller controls the control variables (CVs) within the predefined range. If the number of CVs exceeds the number of manipulated variables (MVs), they must be matched with that of MVs by introducing an objective function that can be the optimizing function. Since the optimizing function is embedded in the control algorithm of APC, both improvement of control performance and optimization can be achieved at the same time. Accordingly, introducing APC is almost the same as introducing multivariable model predictive control. BTG facilities consist of boilers with different fuels and turbines as shown in Figure 4. A part of the power is purchased from the grid. The purpose of optimizing the BTG facilities is to minimize the overall utility costs and CO2 emissions as a result. This can be achieved by minimizing purchased power in the daytime, and maximizing it in the nighttime and during holidays when it is less expensive. APC realizes the benefits by minimizing the gap to the constraints. It took approximately one year to finalize APC, although introducing APC itself takes no more than half a year. The rest of the time was required for the plant test (a test to check the response characteristics of the plant) and commissioning (test operation for performance verification) in order to respond to several operation patterns. The steps for introducing APC are as follows. A feasibility study was conducted first to estimate the benefits of introducing APC. Estimated the expected benefits in the nighttime by analyzing the operation when minimizing the boiler load and defining its constraints. Estimated the expected benefits in the daytime by analyzing the operation when maximizing the boiler load and defining its constraints. After the scoping of the project, the basic design of APC applied to the Takasago plant was carried out. The target facilities and target operations were temporarily determined including the following items. Several operation patterns were selected for designing the control loops including the switching of the pressure control loop configuration between daytime and nighttime and the number of boilers on-stream considering maintenance activities. APC for BTG facilities usually assumes operations for a fixed process configuration to avoid models that are too complicated. It does not include the start-stop sequence control of boilers and turbines or the switch in the loop control for pressure control. Otherwise, multiple process models would have to be prepared for multiple process configurations. As described above, however, APC takes care of multiple operation patterns including the number of on-stream boilers and pressure control loops to achieve further energy saving. The operation patterns to be covered were finally decided considering the results of the plant test and simulation models. Prior to the application of APC, PID control parameters in the DCS of the target BTG facilities were retuned as no unidentified noise or fluctuation was observed in the input signals to the APC and as the targeted PID controllers by APC closely followed the set-point changes. Comparison of the standard deviations obtained before and after the retuning of PID control parameters by normalizing the deviation data confirmed that the fluctuations had decreased quantitatively. Modification of existing control loop configurations and the target facilities was proposed at the same time as retuning of the PID controllers to ensure controllability at the regulatory control level. A plant test was conducted for the BTG facilities to construct the process dynamic models for APC. Since the majority of BTG facilities respond without delay and static mass balancing is easily attainable (for example, through a pipeline the mass flow of the steam discharged from a certain equipment of BTG facilities appears at another equipment downstream without any loss). Models for such facilities like pipelines can be configured relatively accurately and easily. So, the plant test was conducted mainly for the part where the response is slow (e.g. temperature) or heat balance needs to be confirmed. When constructing dynamic models, it is most important to identify the degree of difference in dynamic parameters among multiple operation patterns. Therefore, plant tests were conducted repeatedly for this purpose. A universal model which can be applied to as many cases as different operating patterns was developed to prevent changes in the model configuration for each operation pattern. As a result, the universal plant model requires only parameter changes without changing the model itself according to a change of the operation pattern. Figure 5 shows a part of the control model. The control model is fitted by plant tests. By using the control model, the process response under the APC control can be reviewed against actual behaviors on a PC before implementing it online, thus shortening the commissioning period. In the commissioning, APC implemented in BTG facilities was tested in the actual process for several operation patterns and it was confirmed that the expected benefits identified in the feasibility study were attained. In addition to the intended economic effect, an 85% reduction in the number of manual DCS operations by operators and some reduction in process alarms were confirmed owing to the introduction of APC. 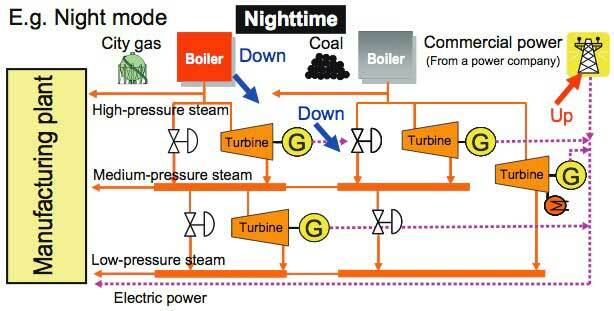 As an example of APC introduction to the BTG plant, boiler load minimization in the nighttime is described below. There are the following constraints for lowering the boiler load. The relations between these constraints and the boiler load are shown in Figure 6. 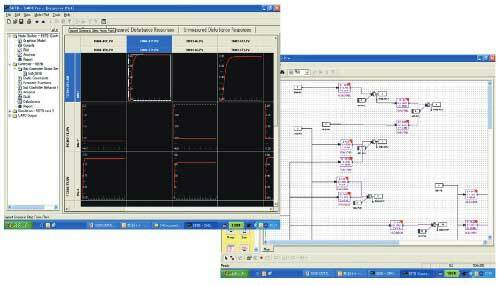 Such relations obtained by the plant tests are embedded as boiler control models. 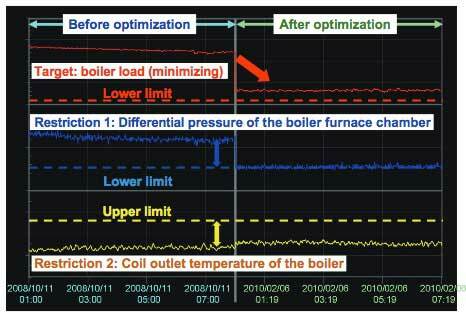 Figure 7 shows the results of the control to minimize the boiler load in the nighttime under those constraints. It can be seen that, after the introduction of APC, the boiler operation at the minimum load achieves closer control to the lower constraint of the differential pressure, while keeping the operation well below the upper constraint of the coil outlet temperature. This report outlined an example of optimizing BTG operation by introducing the Exasmoc multivariable model predictive control package and Exapilot operation efficiency improvement package to BTG facilities. In this example, overall energy consumption in a utility plant was reduced (equivalent CO2 emission reduction of more than 1000 t per year). In addition, the process control by combining DCS, Exapilot and Exasmoc helped reduce the workload on operators and the number of process alarms. These effects can only be achieved when the enthusiasm of plant staff is combined with timely advice by Yokogawa. In the Takasago plant, further improvements to controllability and minimization of the time required for changing the boiler load will be investigated. VigilantPlant Services, Exasmoc, Exarqe, Exaspot, Exacoast, CENTUM, Exaopc, and Exapilot are registered trademarks of Yokogawa Electric Corporation.